A little while ago I took a trip to the Wildlife Heritage Foundation based in Kent. 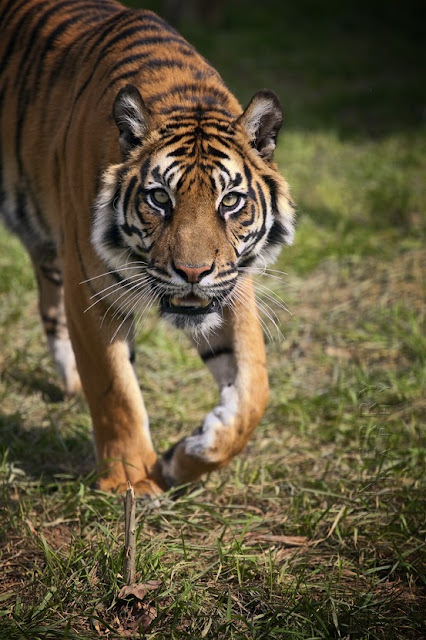 This charitable organisation has been running The Big Cat Sanctuary since 2000, their mission is to protect big cat species around the world from extinction through their successful breeding programmes. Part of the way they raise funds for their projects is hosting photography days, where you can get up close (but not too close) with the various species and get a few snaps. Your not allowed in the cages with them of course, but you can get right up to the fence to get the shots, assuming that is the residents of that particular enclosure are not being too cantankerous. If they aren’t in the mood for a close-up, a quick snarl and the flash of canines soon has everyone stepping back fairly briskly. Our first visit was to the cheetah enclosure, these inquisitive animals were quite comfortable with us being there and it wasn’t long before they wandered over, in that nonchalant way of theirs, to see just what we were up to. In fact cheetahs are quite easily domesticated, the ancient Egyptians and Romans used them to hunt, hence the name ‘hunting leopard’, although they are most closely related to the puma and jaguarondi. While they are not a true ‘big’ cat, as they cannot roar, instead issuing mews, hissing, chirrups and yowls, they are one of the oldest extant cat species, still closely resembling their forebears from 200,000 years ago. something a bit closer to home. meaning it out performs most sports cars. Once the cheetahs had found something else to amuse them, we moved on to one of their main predators, the African lions, who in the wild kill approximately 75% of cheetah cubs and have no problem frightening away the adults from their own meals when they happen across them. Of all the cats at the sanctuary, and despite expectations, these three male lions were the easiest and safest to get close to, they would happily pad along the perimeter of the enclosure right in front of us, with no hint of unease or hostility. It was quite an experience to have a 200kg lion no more than a few inches away, listening to the heavy breaths and almost feeling the reverberations from the low rumbling sounds they emitted as they strolled past. to be in fine fettle. The African lion is classified as a ‘vulnerable species’ - one which has been categorized by the International Union for Conservation of Nature (IUCN) as likely to become Endangered unless the circumstances threatening its survival and reproduction improve. - having seen a major population decline of 30–50% over the past two decades in its African range. Lion populations are untenable outside designated reserves and national parks, with habitat loss and conflicts with humans currently the greatest causes of concern. The three sides of an African lion, as he peruses the surroundings. The next cat was of a smaller variety, namely the clouded leopard, like the snow leopard, these cats are a bridge species between "big" and small cats as they cannot roar like true "big" cats but do not purr on the inhale like small cats. They make a range of different vocalisations from chirrups, yowls, mews, to everyone’s favourite sound, the prusten "chuff". This is considered to be a friendly and non-threatening alternative to purring. In German, prusten means to sneeze, snort, or suddenly burst out laughing. Clouded leopards have proportionally the longest canines of any felid. They have distinctive "cloud" marking of darker ellipses on a coat which varies from tawny to silvery-grey. They have proportionally large feet, short legs and very long flexible tail which gives them excellent balance and allows them to live almost entirely in the trees. They have very large eyes with distinctive tapetum lucidem which gives them excellent night vision, as they are almost entirely nocturnal in the wild. Ben shows off those impressive canines. even hang upside-down from a tree branch. 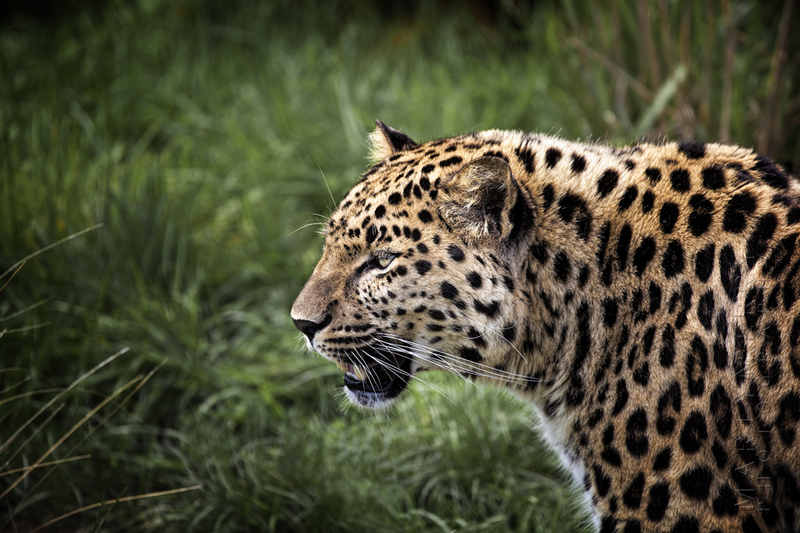 So from one leopard to another, the Amur leopards, the rarest and most critically endangered big cat in the world. It is estimated that there are only 28-30 Amur leopards remaining in the wild, the majority of them residing in an area of Far-Eastern Russia, where they have to contend with habitat loss due to the practice of forest burning to clear land for crops. Add to this the acute problem of potential inbreeding, and it’s been suggested that the remaining population could disappear as a result of genetic degeneration, even without direct human influence. The WHF are themselves at the forefront of conservation efforts, but with a worldwide captive population numbering only around 180, it means this species future is far from certain. able to leap 12m horizontally and 6m vertically. and carry it vertically up trees to stash and feed in safety. 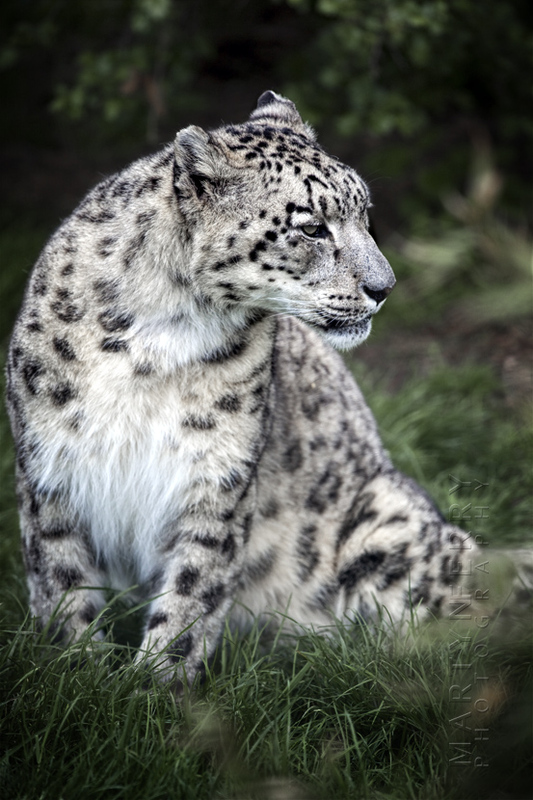 Continuing with our leopard fest, it was time to visit one of most elusive and enigmatic of them all, the snow leopard. Found in the rugged mountains of Central Asia, snow leopards are perfectly adapted to the cold, barren landscape of their high-altitude home, but unfortunately a lot of that lies in politically sensitive areas, often in disputed border lands, therefore they are at high risk from wars and conflict, along with the usual set of man made problems all big cats face. Despite a range of over 2 million km2, there are only between 4,000 and 6,500 snow leopards left in the wild, but as they are so difficult to find, these figures are generally agreed to be very rough indication at best. 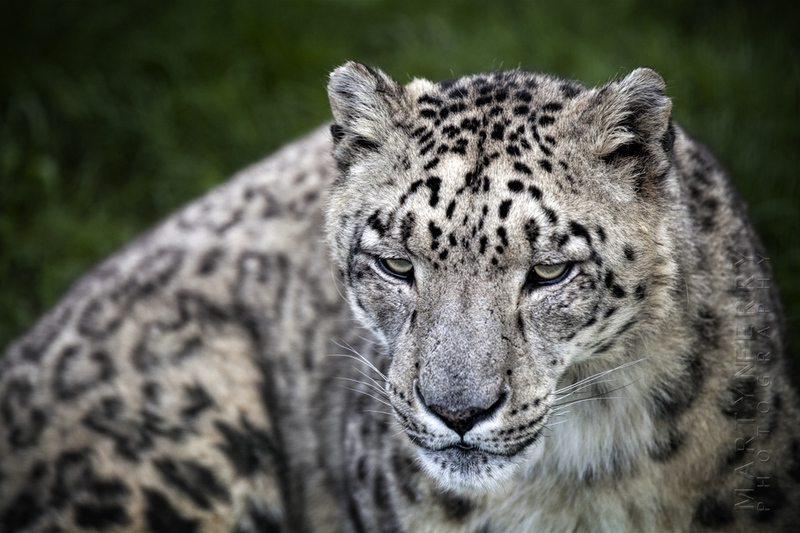 The snow leopard has not been reported to attack humans, and appears to be the least aggressive to humans of all big cats. As a result they readily abandon their kills when threatened, and may not even defend themselves when attacked. Mainly because any injury they sustain will mean certain starvation for them. when sleeping covering their exposed nose with the bushy tip. the leopard against mountain rocks and shrubs. Next up was an animal whose name pretty much sums it up; the fishing cat. At about twice the size of a domestic cat, this small feline is found in various localised wetland regions throughout Asia. Unfortunately those same wetland areas are prime spots for agricultural use and settlement, so with a population in severe decline, the fishing cat is another one on the endangered list. Unlike domestic cats of course, these animals are completely at home in the water, and can swim long distances, even under the water. With 75% of their diet consisting of fish it’s a good thing to, otherwise they might go a bit hungry, not to mention that their name would be something of a misnomer. or dive in and grab with their mouth. Our next host was quite easily the least hospitable of the day, and one we had to watch out for, he was decidedly grumpy and had a bit of a reputation. This was the home of the black leopard, or to give it its generic term, the black panther. A black panther is typically a melanistic colour variant of any of several species of larger cat. 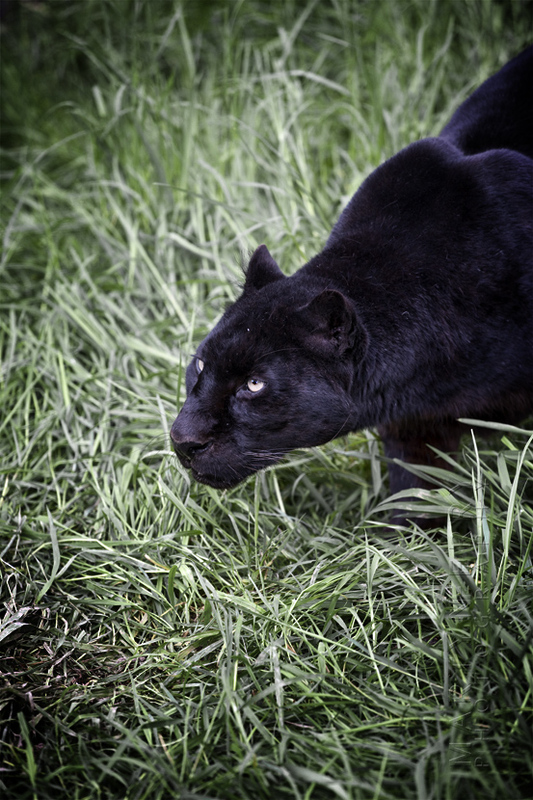 In the Americas, wild 'black panthers' may be black jaguars, while in Asia and Africa, black leopards, in Asia, possibly also the very rare black tigers. Smaller wild cats, like jaguarundi, may also be black. 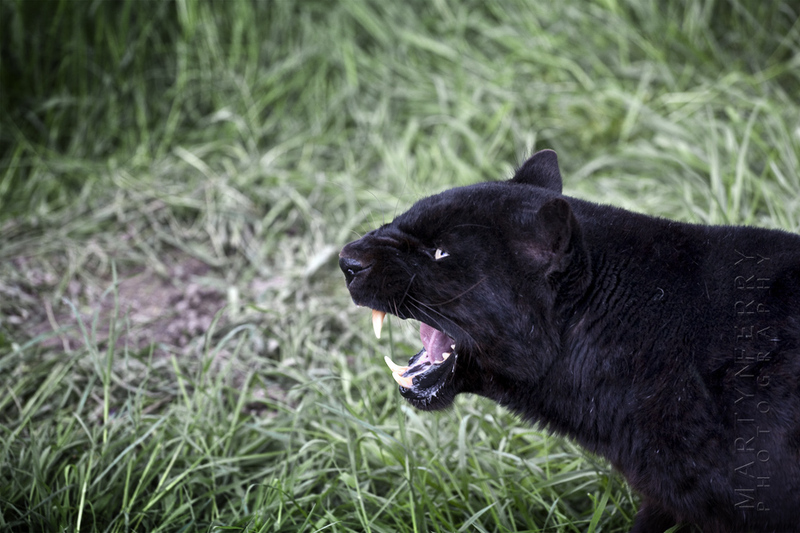 In captivity black panthers may be black jaguars, or more commonly black leopards, and they have been selectively bred for decades in the zoo and exotic pet trades. So it’s fair to say, all black leopards are black panthers, but not all black panthers are black leopards. Khan made his feelings about our presence quite clear from the off. So we politely excused ourselves and headed over to another large cat who didn’t seem overly happy to see us either, but how much of this was down to its naturally stern looks, rather than any real animosity was difficult to tell. This was the puma, or cougar, or panther, or mountain lion, or any of the myriad other names this impressive cat goes by. In fact the puma holds the Guinness record for the animal with the highest number of names, presumably due to its wide distribution across North and South America. It has over 40 names in English alone. 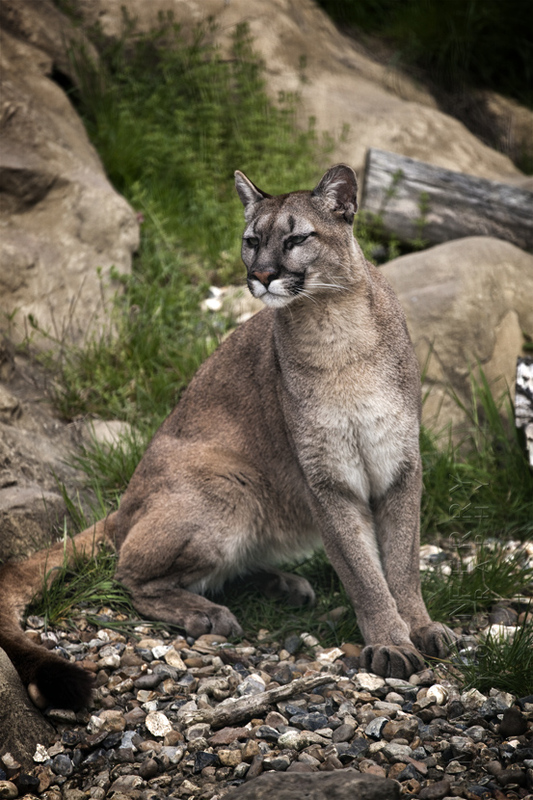 Although the most incorrect of these is mountain lion as its range is not limited to mountain regions, nor can it roar like a true lion, in fact the puma is classed as a small cat, albeit the largest of them, and has more in common with its domestic counterpart than any of the ‘big' cats. But despite this genetic familiarity with Mr Tiddles, the males stand at just under a metre tall at the shoulder, almost two and a half metres long and weighs in around 100kg, about the same size as a human adult. Gram for gram they are the strongest of all the cats and can easily take down a fully grown horse. I for one would probably not be happy to have one jumping on my lap. as 18 ft, and as far as 40 to 45 ft horizontally in one bound. to attract suitable mates for breeding. On to something smaller, but no less effective, it was the turn of the Eurasian lynx, it is the third largest predator in Europe after the brown bear and grey wolf, and the largest of the four lynx species. This extremely efficient hunter uses fine-tuned stealth and pounce techniques to bring down animals four times its size, delivering a fatal bite to the neck or snout of an unsuspecting deer. During winter, its variably patterned coat is long and dense and large fur-covered paws help it move through deep snow. The Eurasian lynx is one of the widest ranging cats and is found in the forests of western Europe, Russia and central Asia. and the extra long ear tufts on the edge of their ears. its prey, lynx do not need the long tail for balance or steering in the hunt. lynx to make up for the lack of tail when communicating with other cats. The fourth and last leopard visitation for the day was the to the North Chinese leopard, a leopard subspecies native to northern China, hence the name. Listed as Endangered, one step below Critically Endangered, only around 2500 remain in the wild in highly fragmented ranges. But as they are so rarely seen, their exact numbers can only be estimated, and it is believed that they are in steady decline. Leopards are the smallest of the big cats, but they're also the most successful. They're stealthy hunters and resourceful scavengers, and they can adapt to almost any environment. and being poached for their skins. Before heading to our final destination, we stopped to look at another of the smaller cats. 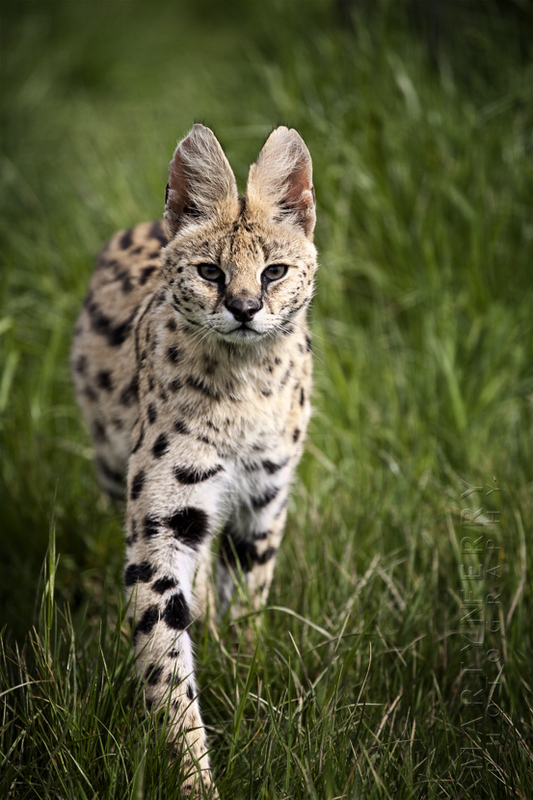 The serval is a strong yet slender animal extremely well adapted for hunting in the savannas. It boasts long legs (the longest of all cats, relative to body size) for jumping, which also help it achieve a top speed of 80 kilometres per hour, and has large ears with acute hearing. Servals have been known to dig into burrows in search of underground prey, and to leap 2 to 3 metres into the air to grab birds in flight. While hunting, the serval may pause for up to 15 minutes at a time to listen with eyes closed. Its pounce is a distinctive and precise vertical 'hop', which may be an adaptation for capturing flushed birds. It is able to leap up to 3.6 metres horizontally from a stationary position. The serval is an efficient killer, catching prey on an average of 50% of attempts, compared to an average of 38% for leopards and 30% for lions. removing mouthfuls of feathers, which it discards. Finally it was the turn of the tigers, in this case the Sumatran tigers, a rare tiger subspecies that inhabits the Indonesian island of Sumatra. It was classified as critically endangered by IUCN in 2008 as the population was estimated at 441 to 679 individuals. It is now though to be less than 200. 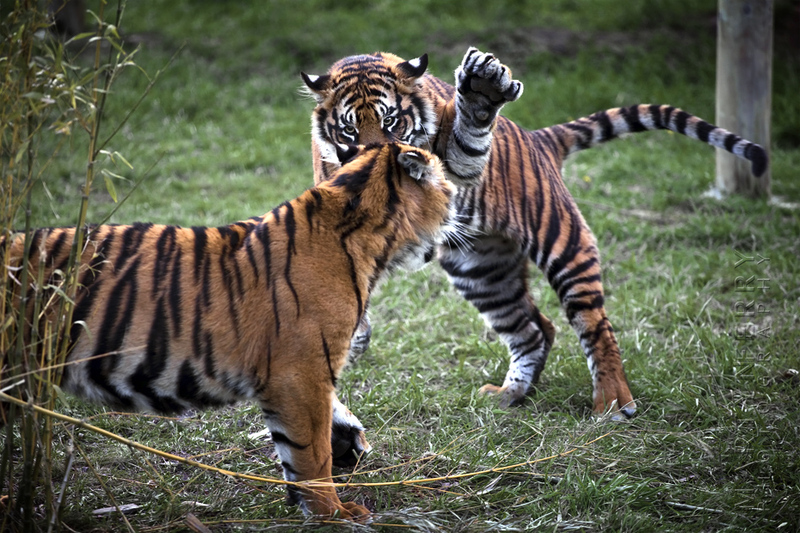 Sumatran tigers are the smallest and darkest of the tiger sub-species. 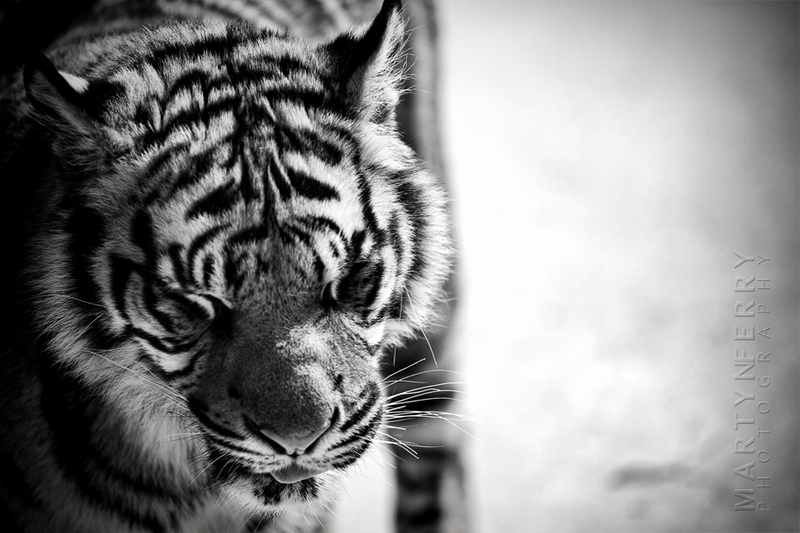 They have the most stripes proportionally and a pronounced "beard" around the face. 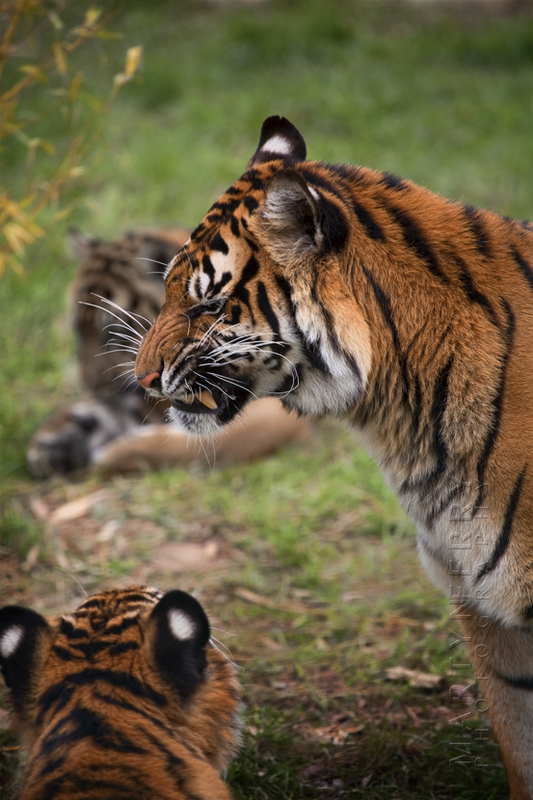 They are excellent swimmers, having semi-webbed feet, and can swim up to 6 miles at a time, One reason for the very rich tawny colour of the Sumatran tiger is due to the waterproof oils in the skin. Frequently poached for illegal trade, primarily for the Traditional Asian Medicine market, sumatran tigers are also threatened by severe habitat loss/fragmentation primarily due to the expanding oil palm industry (in 2010 it was estimated that areas of virgin rainforest equalling the size of 300 football pitches per hour were converted into oil palm plantations in Indonesia and Malaysia). Their eyesight is 6 times better than ours - especially at night. These two youngsters were just mucking about, those claws would be out if it was anything serious. This was mum telling them to pack it in. Seeing these amazing animals up close was an amazing end to the day. 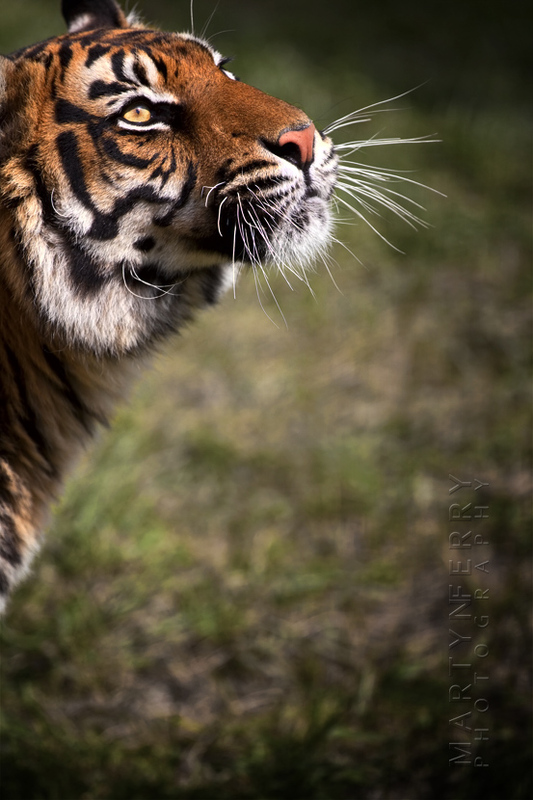 If you're interested in the incredible job the Wildlife Heritage Foundation do, or fancy a visit, which I can highly recommend, or even want to adopt a cat, it can all be found on their website www.whf.org.uk.